Arranged by Rice. 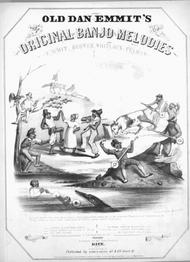 African Americans, Caricatures, Alligators, Cattle, Carts & wagons, Banjos, Violins, Percussion instruments, Roosters, Dancing, Clothing & dress, Robbery, Ethnic stereotypes, Dialects. Lester S. Levy Collection. 3 pages. Published by Johns Hopkins University Sheridan Libraries (LV.14394). De Boatmen's Dance. An Original Banjo Melody, by Old Dan D. Emmit; Leader of the Virginia Minstrels. Arranged for the Piano Forte by Rice. Published 1843 by Chas. H. Keith, 67 & 69 Court St. in Boston. Composition of strophic with chorus with piano and voice instrumentation. 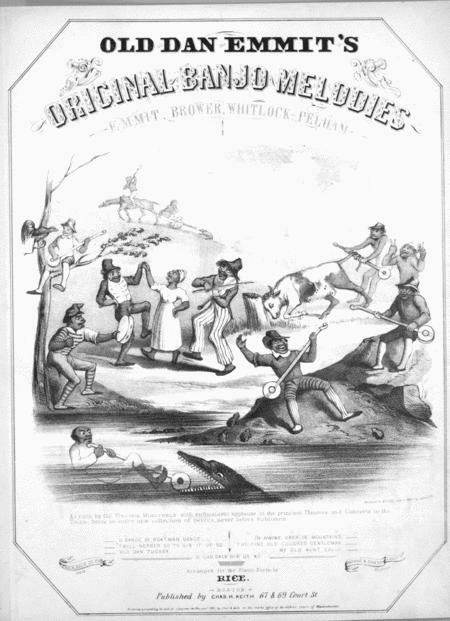 Subject headings for this piece include African Americans, Caricatures, Alligators, Cattle, Carts & wagons, Banjos, Violins, Percussion instruments, Roosters, Dancing, Clothing & dress, Robbery, Ethnic stereotypes, Dialects. First line reads "High row, de boatmen row, flotin down de river de Ohio. ".